Homework is a battle in many homes today. But what if you could have stress free homework in your family? The 6 StepStress-Free Free Homework is the essential quick resource to stop the homework wars! This digital (and printable) fridge guide walks parents through the basics of good homework practices. And it provides additional resources for sticky situations and next-level problem solving, too. Available as a free download from MilKids Ed, every parent will want to grab this great resources for their family! Your quick and easy stress-free homework guide shares six easy steps for busy parents. These are six little things that every parent can do, right now, to set their family up for homework success. When you do these six essential things, you’re almost guaranteed to experience stress-free homework! Homework is full of moving parts. As a teacher and parent, I 100% get that! No two days are really ever the same, no matter how much you try to schedule and plan. Following these six easy stress-free homework steps can take some of the guesswork out of your daily after-school routine. When you follow this guide, you’ll feel more confident and comfortable guiding your child to balanced homework sessions. Your child will find success with these no-nonsense solutions that invite their participation. Every step of homework, from breaktime to when to call it a day, is outlined clearly and concisely. No flipping through a book or searching online. Simply check your all-in-one printable stress-free homework guide for the next step! Working with Meg as a parent coach and advocate can help to solve many school concerns. From setting up a good homework schedule or space to fixing communication with your school, Meg has the professional experience and personal knowledge to help. 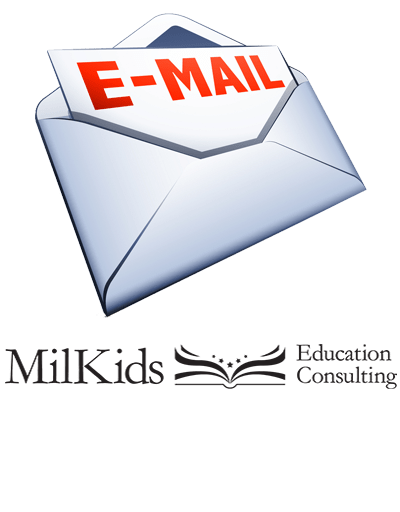 Email Meg at milkidsed@gmail.com to learn how she can help you today!